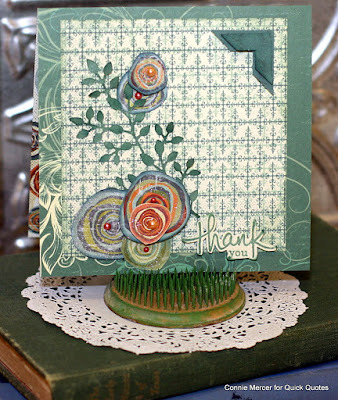 Blog Quick Quotes: Thank You Card with Connie! Thank You Card with Connie! Hi, Connie here with a card using the new Earth Wind Fire Collection (coming soon) by Quick Quotes. I love the green and orange colors mixed together. The greens remind me that Fall will be here soon. The flowers are cut from one of the pattern papers in the collection. I have popped some of them up to give some dimension to the card front. The dark green paper is beautiful, cut with a metal die, for leaves. The leaves and flowers were shaded with PowderPuff Chalk inks. 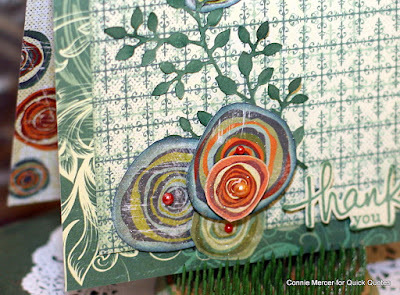 The inks come in many colorful shades that match the paper collections. Earth Wind Fire Collection (coming soon): 104, 105 and 109.